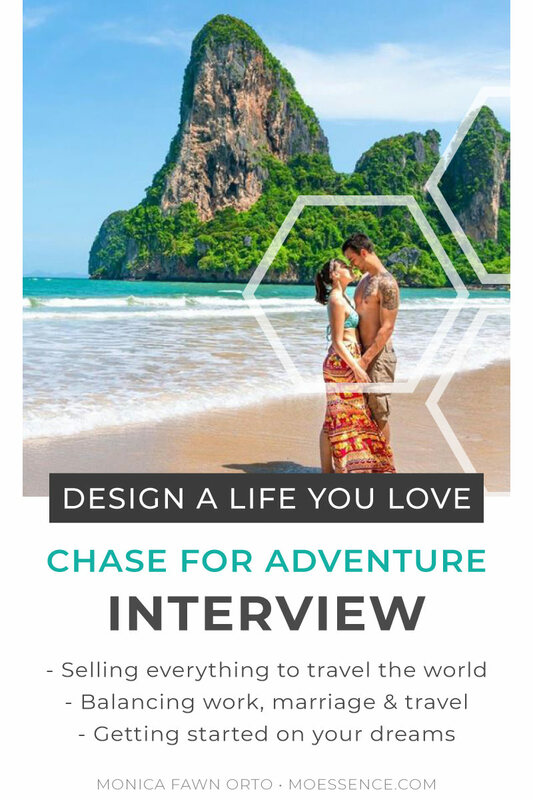 Annette from Chase for Adventure answered the questions I was dying to know about her success and adventures as a digital nomad. Annette and her husband paid off over 70,000 of debit, then sold everything they owned so they could DESIGN A LIFE THEY LOVE NOW while they are building an online business around their passions. Chase for Adventure’s blog and Instagram feed is so inspiring to me because I have changed my mindset around envy, jealousy and the ache that our social media feeds can give us. I shared some great insight to removing “Gap Focus” and “FOMO” as a guest on Chase for Adventure. Let’s get to the amazing tips and insight Annette was so open to sharing with me! Annette thank you so much for taking the time to share a real insiders peek into a life of minimalist living, traveling the world and building an online business. Success is something we all define for ourselves. There are so many ways to enjoy entrepreneurship and that flexibility of time and location and we would love to hear how you’re doing it. What made you want to start Chase for Adventure? “If you had told me a year ago that we were going to sell all of our stuff to start backpacking the world, I would have called you a liar! We were living our quiet lives in Gainesville, FL, planning on buying a house and having kids. Decisions like the one we made start with an inflection point. A point where you realize that life can never be the same anymore. That moment hit March 2017 when I was sitting on my living room floor, in tears, on the phone with the suicide hotline." You were probably not expecting how real we were going to get, but with me what you see is what you get! From that low point, I decided I needed to go out and live the life I wanted to live instead of watching it on someone else’s YouTube Channel. My husband and I had given everything we had, physically and emotionally, working toward other people's dreams and were ready to work that hard for ourselves! So we moved into my in-law's house, sold everything we owned including our cars, and paid off $70,000 worth of debt (we actually have a whole post about how we did that right here). Daniel and I worked 70hrs/week for 8 months trying to save up $15,000 to make our dreams come true! Now, we want to inspire our readers and give them the resources they need to embark on their own adventures around the world. I know that is so true Annette and I used to be one of those people myself! Your journey is amazing, but something that every one of us can do to if we really allow ourselves to find our authentic dreams. What would you recommend to those who are still in their startup mode but looking to enjoy their entrepreneurial freedoms now? “My recommendation for them is to use that hunger for entrepreneurial freedom, to motivate them to do more! When Daniel and I first started Chase For Adventure, it was 8 months before our one-way tickets departed for Bangkok, Thailand. During those 8 months, we were feeling suffocated and trapped by our “real” jobs but knew we couldn’t quit before we left. So, we used that exasperation and passionate desire to live life and do our passion full-time that we dumped it into building our YouTube channel and website. By the time we were ready to ditch our real jobs in June of 2018, we felt so much more ahead than we would have been. Yes. Working to see growth and make constant never ending improvements gets me so excited too! You sold all your belongings and travel the world. We are dying to know what does that actually look and feel like!? Beyond the gorgeous photos on Instagram that is. We know and love that! Haha! I’m glad you’re liking the Instagram! It really is such a beautiful collection of treasured memories. I use it like a scrapbook of sorts and LOVE looking back at our Instagram Story Highlights when telling our friends what a given country was like! It’s like having an organized video album in your pocket at all times! “Honestly, it was hard. I didn’t realize how attached to my belongings I was until we started selling it all. If you’ve seen any of our earlier videos, I was openly scared to bits. We worked so hard to earn all of that stuff that we felt like we had to keep it or we were moving backward. We moved into my in-law's house during that time to save money and sold both of our cars. We sold our clothes, our furniture, and basically anything that didn’t fit in a backpack. Everything that we did during those 8 months felt like a step backward even though they were all steps in the right direction. But all of those anxious feelings disappeared the moment we stepped onto our first flight. My butterflies were so intense, I seriously thought I was going to throw up. From the moment we landed, we were in passionate love with every single day of our lives thereafter. Since then we’ve gone cliff jumping into waterfalls and Jet Ski Island hopping in Malaysia! We’ve bathed Elephants in Thailand, and ate Kangaroos in Australia. We climbed to the summit of Mt. Fuji in Japan, and snuggled monkeys in Bali! Our life is a total dream, mixed in with some major hard work and sacrifices. I wouldn’t have it any other way! What’s the wisdom you would like to impart on those who are dreaming of doing that too? “Just do it! If you sit there and think about all of the reasons you shouldn’t, you’re never going to leave your front porch. I used to always say, “I never have the time”, or “I don’t have the money”. But guess what? Life is still moving past us and if you don’t make the time or take some risks you’re going to die never having done what you wanted to. I personally don’t see a point in living life, if I’m not going to live it with some gumption. So instead of making excuses as to why you can’t, look for all of the ways you could and why you should! Quit your job and make the time! Sell all of your stuff, work three jobs, and HUSTLE so you can save up the money. This is definitely not a lifestyle for the lazy, but neither is entrepreneurship. This advice is something I’m going to tap more into myself. I am really excited to learn more about traveling for free! There are so many amazing places to visit in the world…. What have been your favorite places to travel to so far? “Oh my goodness! With 37 countries under our belt, this question is becoming harder and harder to answer! Thailand is definitely a country that has swept me off my feet! The scenery looks like something pulled out of a movie (The Beach and James Bond, anyone? ), the people are sugar sweet, and the food is to die for. To add the cherry on top, everything is super cheap! We were spending $10 a night for a hotel room, and no more than $1.50 per meal! We were able to explore Thailand for 3 months, and not conservatively, for just over $3000! Those sound like fantastic trips! When traveling, and in my home and business life I practice minimalism. Is that something important to you too? How is minimalism a part of your life? How do you balance the work/marriage/adventure life in entrepreneurship? “It’s definitely a juggle, hehe. Do you remember when you were in college and people would tell you that you had to pick between social life, good grades or sleep? Sleep definitely loses in my world. With that said, however, a healthy dose of time management always helps. I keep a calendar and I write 3 things that I want to get accomplished on that day and do what I can to get to it done. What strategies did you use or recommend that brought you the most success in your business when you were starting up? “I started growing my business through Facebook in the early stages because it allowed me to reach people who were already invested in me as a person. Asking friends to share my posts and help me chase my dreams was very helpful! Wow Annette me too! Any niche can grow their traffic immensely using Pinterest and the Tailwind App. Interested in 5x your website traffic like I did? TRY TAILWIND FOR FREE THROUGH MY AFFILIATE LINK. What's the funniest thing or your favorite story about being a location independent entrepreneur? What’s your favorite blog post that we can read? Annette and Daniel, thank you again for sharing your amazing adventures with us! Have you found some great takeaways from the amazing insight Annette shared with us today?! I have some of their amazing images on my vision board and have made a commitment to myself for more adventure and travel this year. What inspired you and what’s one thing that you can do to start designing a life you love?